Chez Beeper Bebe: Look Ma! I'm in Woman's Day! Look Ma! I'm in Woman's Day! Earlier this summer I was asked by Woman's Day to design a little something for a special holiday issue and I am so excited to now see it in their Best Ideas for Christmas issue (on news stands now!). This was particularly cool for me because when I was kid, my mum always bought Woman's Day and I grew up looking at this magazine, perusing the craft pages even back then, and sometimes even making something with my mum from the magazine. So, it is all full-circle-feeling to be in the magazine today. And the issue is a good one--chock full of lots of crafty ideas for gift wrapping, a retrospective of the best cookie recipes from the past 9 decades (who knew they have been around 73 years now? 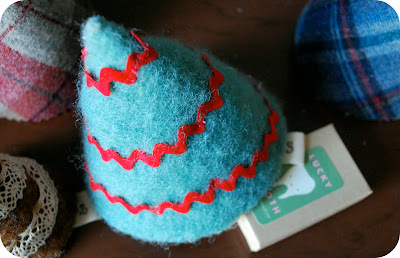 ), and loads of other holiday decorating ideas. 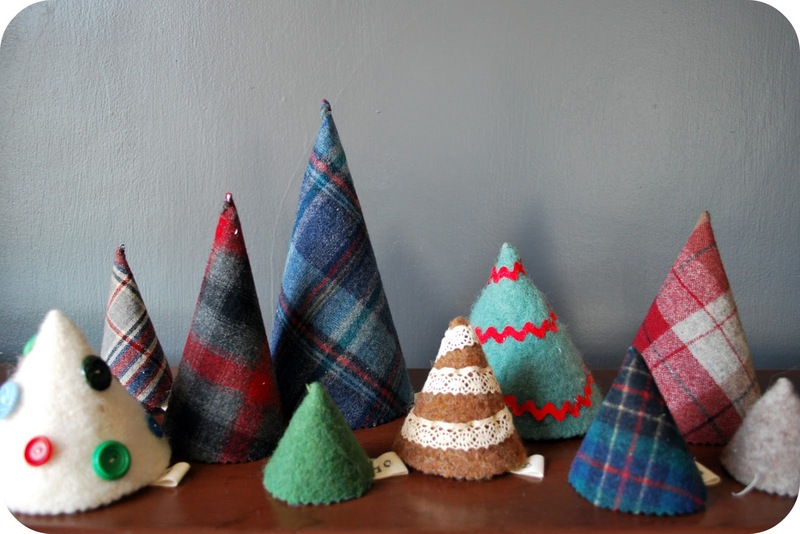 And this is what I contributed--a set of variously sized pine trees made from recycled Pendleton plaid wool shirts and felted sweaters--each one tagged with a piece of twill tape stamped with numbers 1-24 to represent the days of advent. What I love about this project is that it is entirely hand sewn (my favorite kind of sewing), and it is really quite pretty to look at when you line all the trees up on a mantel or sideboard or something like that--having both form and function. And because the trees are all hollow, they are perfect for stashing a sweet note from a family member, a lovely nature find, a truffle, a funny little limerick, or even one of Emily's Lucky Teeth. So, go check it out at your neighborhood book/grocery store, or you can also see a posting about the article I was in on Woman's Day's website. 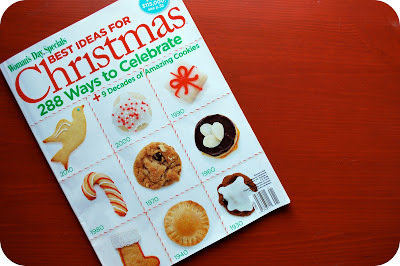 It has photos of my project and other simple holiday projects designed by a handful of other bloggers (like Maya's own fantastic advent calendar made unbelievably from TP rolls), plus downloadable instructions--find all the goodness right here. Congrats! 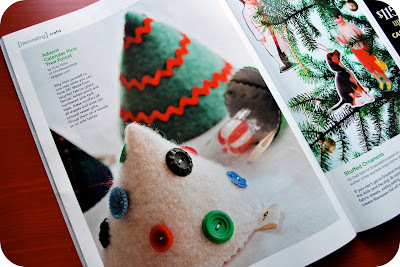 This looks like a fabulous craft, and I'm adding this issue to my magazine shopping list. So cute Holly... now I know what I'm doing for my fireplace this year! Congrats on the magazine. Thank you, everyone. It is exciting to be in my first national magazine. It was also fun to challenge myself to put something like this together because I would admit that I am really not the sort of person who does a lot of holiday decor designing--but I am happy with how this turned out and will really use it myself. Oh, and if anyone makes some, please share photos in my Beeper Bebe project Flickr group. I would love to see your work. congratulations! it looks fantastic and very beeper. Congratulations Holly! I was so excited to see your wonderful contribution... felt like I had a friend to hold hands with!! I loved your trees, such a great idea! Thanks for the links... I hadn't discovered those. Congratulations! That is way cool. They are really cute and I think are lovely holiday decor. Since we don't do Christmas (Jewish) I am imagining these in orange and black for Halloween! Maybe with a little brim for witches hats! I love the witches hat idea! So fantastic! Holly! That is awesome! I love love love it! I'm going to go out and buy the magazine for sure. My daughter is totally going to want to do this. I've been saving toilet paper rolls all year so I can make Maya's advent calendar, but now I'm torn! Those trees are so great! Threaded Basil--Since you have been planning and saving for Maya's advent calendar, I would still make that--and just make a couple of my trees for decorative purposes...you can always make a full advent of trees later if you want. This article is no longer on the Woman's Day site. Do you still have the tutorial?